[…] On the issue of the Playback MPs-5 this is unquestionably the most musical CD/SACD player I ever owned/tried in my system. Very refined, dimensional and most of all musical. Replaced a Burmester 089 and never looked back. I have the limited edition which is grey in color incorporating some of the tech that made its way to the newer player the MPS-8, which I hear that is again better than the MPS-5. Thanks so much for your thoughts on the Playback Designs MPS-5 SACD Player and DAC. High praise indeed not to look back from a Top Line series Burmester 089 CD player. The qualities you speak of; refinement, dimensionality and musicality are exactly what I’m after. With Esoteric's future being clouded by the bankruptcy of Gibson a replacement CDP will likely see me change brand. Audiophiles rarely agree on much and when common ‘opinion’ is found it is frequently motivated by the need for acceptance and belonging. Psychologists have observed that the need to belong influences human behavior. In Abraham Maslow's hierarchy of needs, belongingness is part of one of his major needs that motivate human behavior. The hierarchy is usually portrayed as a pyramid, with more basic needs vital to our survival at the base and more complex needs near the peak. The need for love and belonging lie at the center of the pyramid as part of the social needs. I have long believed that a hierarchy also exists for successful audio reproduction in our homes. At the base of the pyramid and thus the most vital to success – by far – is our listening room. Like most audiophiles I spent many years ignoring or otherwise taking for granted the importance of setting up a decent space in which to appreciate music. In naivety the only upgrades I ever imagined were related to hardware – bigger, better, more expensive etc. Naive, because I didn’t then appreciate that much of the sonic benefit derived from more expensive hardware was to a large extent being masked by poor room acoustics. You see – our listening space in concert with our loudspeakers acts like a great big tone control, boosting some frequencies whilst attenuating others. Moreover, sound waves reflect from walls, floors, and ceilings, reaching our ears milliseconds after the direct sounds from the speakers can end up smearing and muddying the original sound. Leading Hi-Fi Magazine Stereophile reckons 95% of the systems in audiophile homes are being degraded by a bad listening environment. Sadly for most, the room is the first thing we start with and the last thing we think about…. After the room, the next most important item in the hierarchy is what I call the system foundation. The system foundation includes clean AC mains, dedicated power lines to the audio room, high quality electrical and mechanical earthing, equipment supports and cabling. Next in the hierarchy are the loudspeakers. Of all the components in your audio system, the loudspeakers job is by far the most difficult. The loudspeakers drivers must not only reproduce the sound of all instruments – but do so in a fashion that is convincing and real. In digital playback systems your loudspeakers will almost certainly be the highest distortion devices and consequently I’ve tended to spend more on loudspeakers than electronics. Finally, the lowest in priority in the hierarchy is the amplification and the source. This is not to say they are not important – they are – but relative to the above less so. 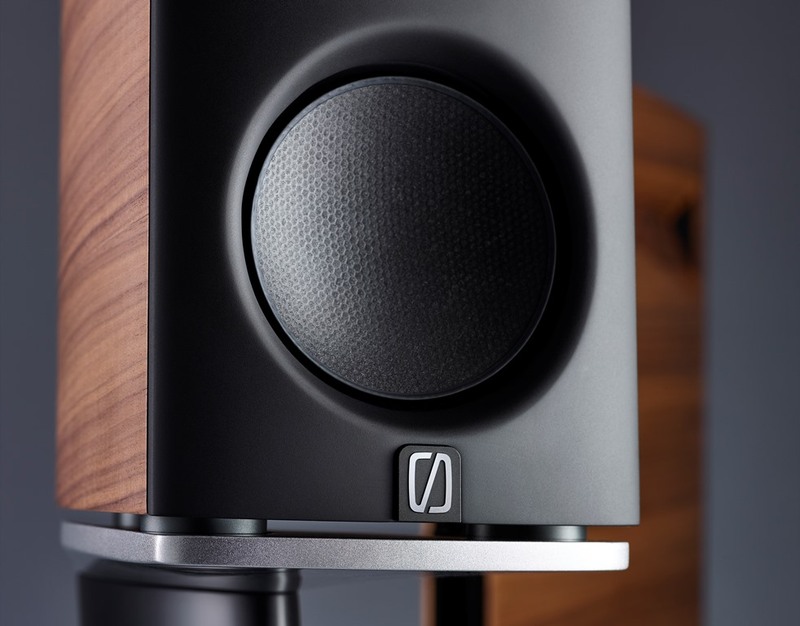 Produced in Germany by Audio Video Manufaktur GmbH the amplifier with an MSRP of US$ 4995 would not be an immediately obvious candidate to mate with my newly arrived Børresen Acoustics model 01 loudspeakers…. In truth, the CS 2.2 may not be a long term solution but I’m interested to observe just what sonic results can be achieved using a modern “all in one” box. 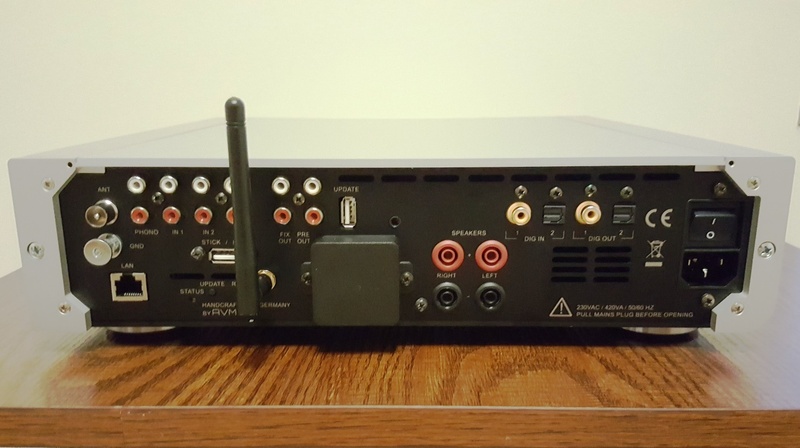 Within the compact box is a Class D amplifier rated at 165 watts into a 4 ohm load, a TEAC sourced slot loading CD player, an FM tuner with RDS, a DAC, a phono stage with MM & MC input, a dedicated headphone amplifier, Wi-Fi connection, LAN connection and internet streaming facility. Streaming wise, there is full support for Qobuz and Tidal and format support for MP3,WMA, AAC, OFF Vorbis, FLAC (192/24 via LAN), WAV (192/24 via LAN), AIFF (192/24 via LAN), ALAC (96/24 via LAN) and supported formats for UPnP, 1.1 UPnP AV and DLNA compatible servers and NAS. Inspiration to use a modest amplifier with the Borresen speakers actually came from a Facebook post from Lars Kristensen the CEO of Ansuz Acoustics, Denmark. Lars had been visiting Lydspecialisten, a local Borresen Acoustics dealer in Aalborg, Denmark who were demoing the Borresen 01 loudspeakers with a US$1995 Primare I15 Prisma 60 wpc integrated amplifier, DAC and streamer. Lars comment in his post that “It was just playing music in a way you would not expect even from very big and powerful systems.” It was in his opinion a “giant killer” system. Of course – as all top audio dealers do – Lydspecialisten had the system foundation well sorted. Another reason for opting up front for a low (ish) cost amplifier was I really wasn’t sure what type of amplifier would mate best – for my ears – with Borresen loudspeakers. Obvious choices might include Soulution (Switzerland), Constellation (Australia), Aavik (Denmark) or Jeff Rowland (USA). But here’s the deal; you first match the loudspeakers to your room, then you match the amplification to your speakers – which is why the purchase of amplification should be a post script not a preamble. Just why that sequence is important was driven home again to me this week when it dawned on me after the initial 100 hours of listening to the Borresen loudspeakers that my search for longer term amplification should also embrace valve based amplification, perhaps VAC (USA) for example. Some caution is needed with the initial opinion because everything is breaking in; amplifier, speakers and accessories; but nonetheless, colour me impressed. 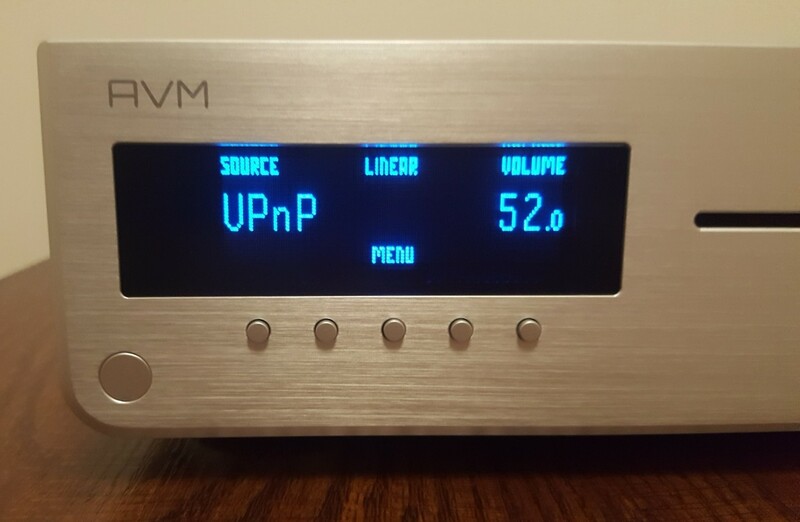 I’ve connected the AVM CS 2.2 to my NAS drive; an InnuOS ZEN (United Kingdom) dedicated music server / CD ripper and streamer which is loaded with my CD library and has ROON support. My Android mobile phone (iOS also supported) acts as a remote control for all the AVM functions and provides access to the NAS library to. 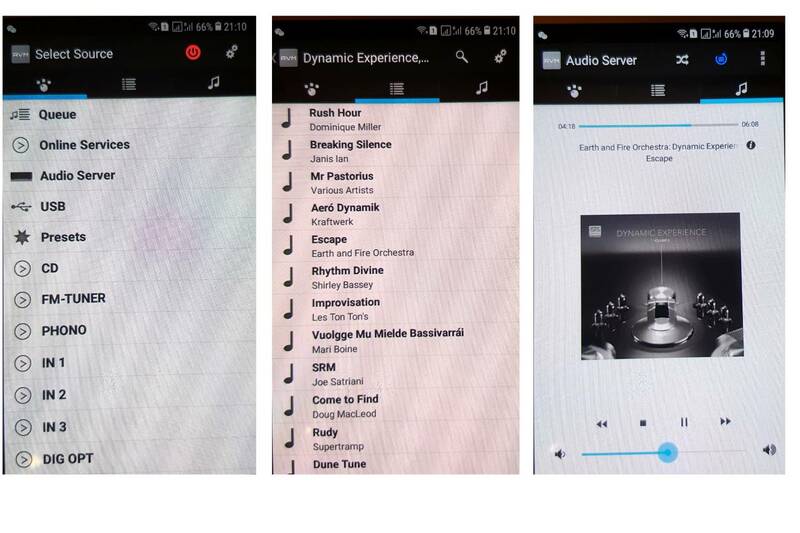 Photo 4: Android or iOS phone used as a remote control for the AVM, seen here are source selection, track options on a NAS stored album and specific track controls including volume. 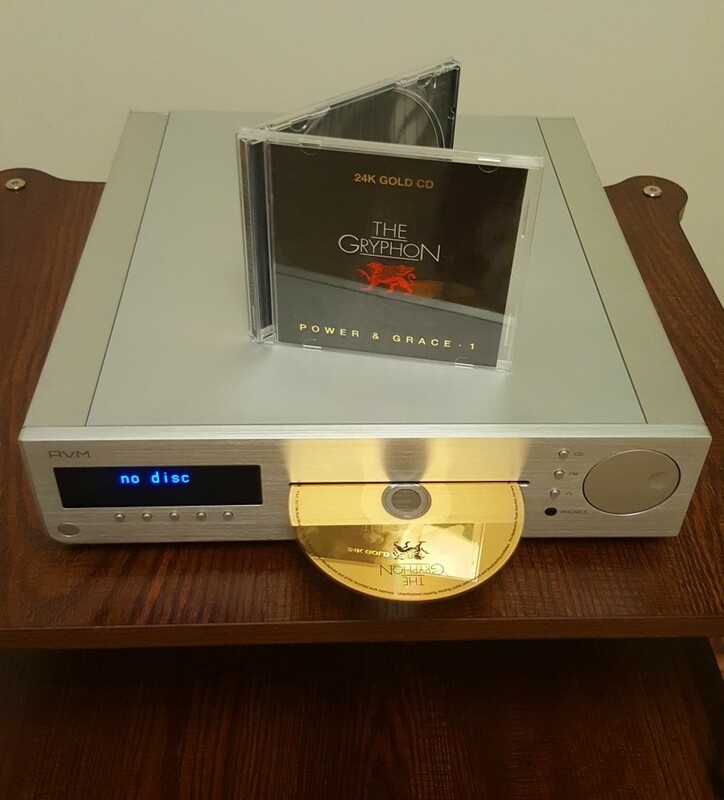 Using CD’s played via the inbuilt transport which proved to be the best source tried the AVM CS 2.2 sounded refined, dynamic, detailed and smooth. The smoothness of the reproduction caught me somewhat off guard because of a prejudice I carry against Class D. I’m no fan of Class D amplification which in times past I’ve found dull, dry, unpolished and lifeless, lacking in warmth and emotion. Yes, Class D can muster iron fisted grip on unruly bass thereby providing a cleaner window for the mid-range to function but if the overall presentation leaves one feeling detached and uninvolved with the music then where is the profit? Photo 5: CD was the best source tried so far. The reality was the same CD ripped, stored and streamed doesn’t sound as good as local playback. There are just too many variables in the path. Thankfully the Class D implementation here has turned the corner. 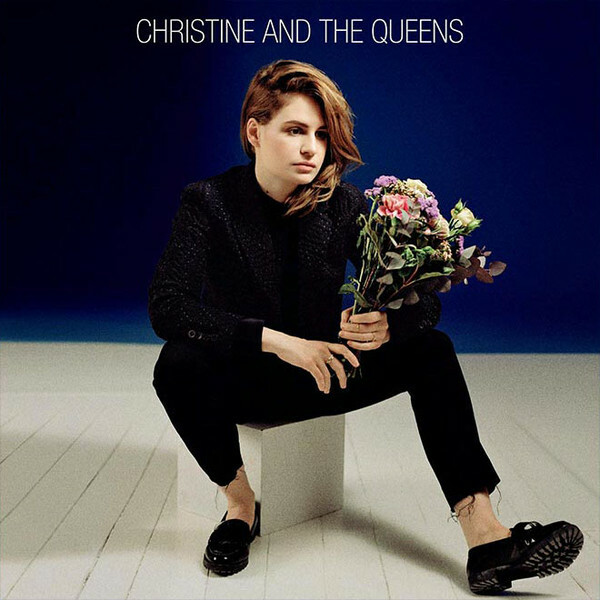 Play a demanding track like Christine and the Queens “tilted” [Christine and the Queens, Atlantic, 552198-2] you are greeted with a low end which is taut and well defined and a top end that is open and strikes a nice balance between liveliness and smoothness. Soundstage reproduction is impressive. No doubt aided by the Borresen 01 speakers which particularly excel in soundstage depth, reproduction of various orchestral recordings portrayed excellent dimensionality and sense of space around and behind instruments. And what about heavy metal you ask? 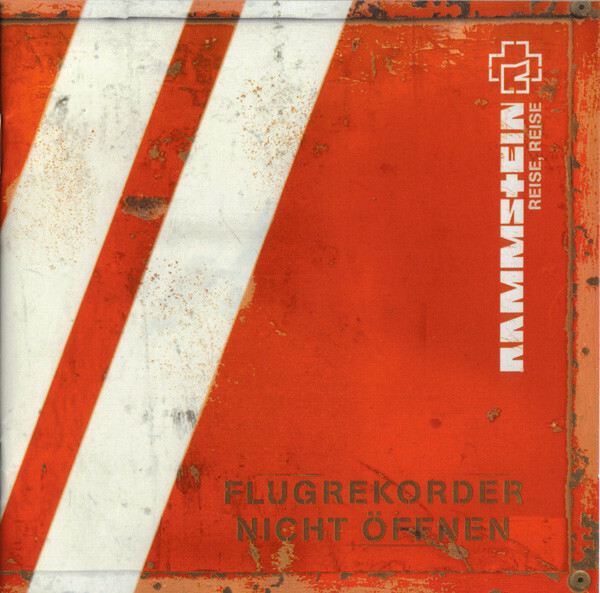 In “Los” by German industrial metal band Rammstien [Rammstien, “Reise, Reise”, Universal, 06024 9868150] the blend of pulsing acoustic guitar in drop C tuning and incessant bass beat were well managed by the amplifier – even at loud listening levels – which also kept the growling gravelly bass vocals of lead singer Till Lindemann nicely articulate and separate. 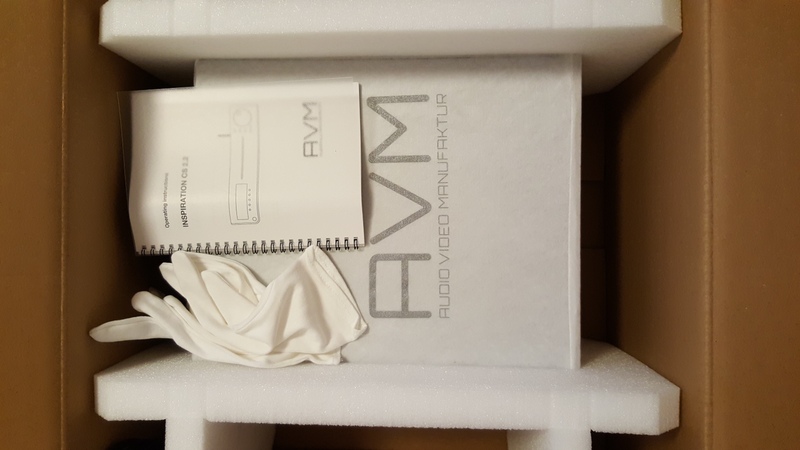 In summary, initial listening observations hint that the AVM CS 2.2 is not just another “add speakers and you are done” lo-fi solution for modern space constrained households. A more detailed review of the product will take place later in the year once we have more hours of use on it. Having introduced the system foundation and electronics, in my next update I will discuss the high lights and low lights of my first 100 hours with the new Børresen Acoustics model 01 loudspeakers. You know how it is when you’re unpacking your latest audio purchase. You’re just giddy with excitement, visualizing how you’ll use the product even before it’s out of the box. Ignore the white handling gloves and the equipment manual, the adrenaline is flowing, you are not interested in distractions. What you are interested in is an EXPRESS installation. Yes folks, retail therapy really works! The EUPHORIC – if I buy it – it will sound wonderful in my system – state of mind. The kink in the works? Well, out of the box the Borresen speakers did not sound wonderful at all. The euphoria rapidly dissipated to disappointment. My business keeps me on the move and 2019 finds me in another new listening space; small in size measuring around 3.4m (11ft 1’) wide and 5.3m (17ft 5’) long. Plans are afoot to acoustically treat the room but at the moment the room is almost bare and highly reflective. Initial placement for the speakers sees them about 1.8m (6 feet) from the front wall and about 0.35m (14 inches) from the side walls to maximize the space between and behind the speakers. As with Raidho speakers I’ve not found any issue with placing the speakers close to side walls, though I suspect, given the power of the ribbon tweeters, treating the first side wall reflection points with absorption or diffusion (to be tested) will yield great benefit. The speakers are sharply angled to the listening chair which is placed in a non-equilateral triangle near-field position purposed to hear more of the speakers and less of the room. More detailed consideration of speaker placement will be undertaken once the loudspeakers are broken in which according to the manufacturer is still several hundred away. Source and amplification are provided by AVM (Germany) mentioned in the preceding post and foundation (also not optimized yet) consists of Ansuz Acoustics (Denmark) accessories earlier mentioned and a dedicated AC circuit to the room. Out of the box and in the context of the above system and listening room the overall sound quality was a disappointment. I do stress “overall sound quality” here because let’s face it, you don’t listen to loudspeakers in splendid isolation. Our ears hear the summation of room interactions, speakers, electronics, accessories and a myriad of other influences. So, what was wrong with the overall sound? To begin the overall sound was thin. By this I mean deficient in bass or lacking bass weight. This then drew attention to the treble which on many recordings came across as a bit ‘hot’, that is tipped up in the higher frequency range. Playing an electro-pop album like Christine and the Queens (Atlantic Records : 2015) which has an excellent mix of foundational throbbing electronic bass and Héloïse Letissier’s beautifully textured and slightly gravelly vocals the overall balance sounded much better listening to it from my office next door where the bass carries but the treble is attenuated. Photo 2: I think it was Mike Bovaird that first drew my attention to this disc. While the CD recording has a truly woeful DR (min 3, max 8) in 2016 it was the UK’s biggest-selling debut album of the year. Its infusion of floaty French synth-pop that delivers delicate, thought-provoking punches amid its house music-infused substantial beats and synth-string melodies make it interesting musically and a nice test disc. Mercifully the overall sound was not harsh or sibilant, both of which I simply can’t stand – it’s just out of the box the balance wasn’t right to my ears. 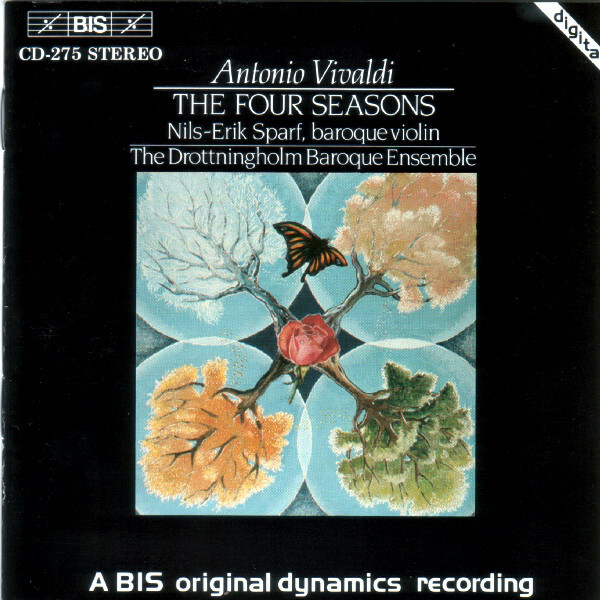 Moving on to the simply outstanding (BIS Records : 1985) recording of Vivaldi’s - The Four Seasons performed by The Drottningholm Baroque Ensemble, the opening movement of L’inverno came across as wiry. Yes, the tone should have a slightly abrasive edge – it is after all winter – but reproduction here lacked the colour and body I’m used to courtesy of previous audio systems. Furthermore, the soundstage was distant and flat suggesting I needed to invest some more time in positioning the speakers. Photo 3: Nils-Erik Sparf and the Drottningholm Baroque Ensemble together with BIS demonstrate that high fidelity recordings are not a recent advent. 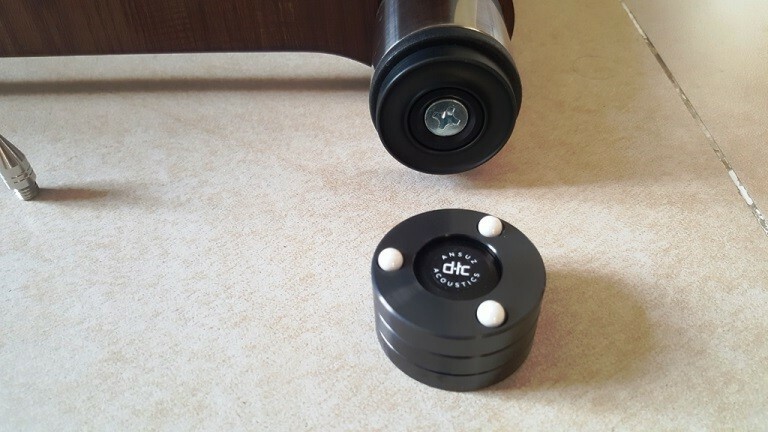 I had been told by the dealer that the Borresen speakers are sensitive to positioning and small incremental adjustments are necessary to obtain the very best from them, so I played with positioning further increasing the toe in a touch more and continued listening. In the absolutely splendid melancholic melody, Eden, produced by Belgian group Hooverphonic and covered here by Sarah Brightman (Angel Records ‎: 1998) the opening Gregorian choral chant was satisfyingly huge in scale and otherworldly in presence. The atmospheric ambience was deep, wide and very high – higher in fact than I’d experienced with Raidho Acoustics loudspeakers with far superior electronics and in a properly treated listening space. 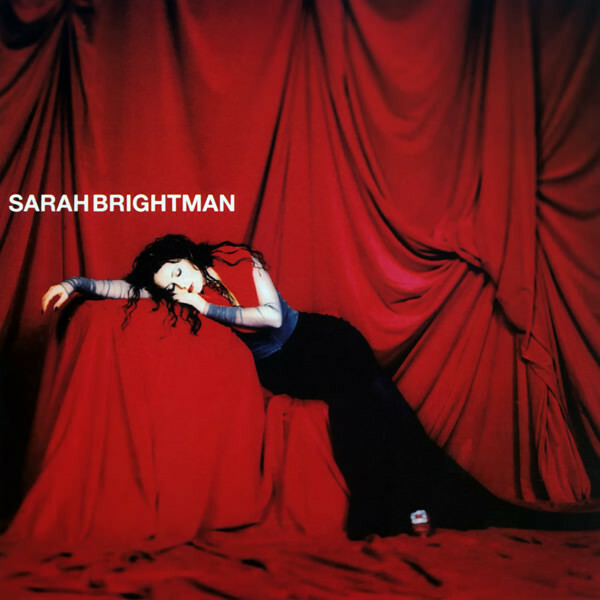 And speaking of height – I also observed something else interesting with this track – that the central image of Sarah’s ethereal voice which floats effortlessly in front of the backing choral cacophony remained at a similar height both standing and sitting in the listening chair. In fact the entire track could be enjoyed as much standing up, as sitting down. Now recognized, this observation held true for other music played during the first 100 hours. Nonetheless, the overall mix however was still lean, that is, slightly bass shy to my ears; but otherwise, the spaciousness of this “Enigma style” crash between new age and classical genres was simply glorious. Photo 4: Eden - Frank Peterson, a German music producer has his Enigma rooted fingerprints all over this recording. Very highly compressed but the soundstage is floor to ceiling in height and extends wide of the speakers. This track is especially glorious on big panel speakers and big MBL’s. Sarah’s voice can and indeed will sound sibilant on speakers/systems which highlight this coloration. Closing out my initial listening impressions was a track entitled “Los” by German industrial metal band Rammstein (Universal Records : 2004) as some – myself included – will be interested to know about the power handling abilities of the Borresen speakers. This track blends a down-tuned acoustic guitar riff with incessant bass beat which literally blitzkriegs its way around the speakers and listening room. I wrote back in January 2013 how this same track tripped up my then new Raidho Acoustics D2 speakers by fairly easily bottoming out the centre mid/woofer. Well, here we are six years later and the tiny tot Borresen 2 way Compact Monitor Loudspeakers had no such issues. At near full throttle on the amplifier the Borresen woofer had no trouble coherently tracking the dynamic contours of the massed 2nd to 5th octave energy contained in this track. Photo 5: Not your average girl with acoustic guitar audiophile disc (yawn). These guys use arm mounted flame throwers in their live concerts. Need I say more? I think everyone hopes that new purchases will be perfect out of the box – especially if that box has a hefty price tag attached. Up to this point though there is a gap between what I’d hope for sonically from the system and what is actually being delivered. The thin/lean overall presentation could be down to any number of causes. Perhaps the speakers need more time to break in – the manufacturer certainly thinks so. Perhaps the amplifier is lean in character or being new needs further break in time too? Perhaps the currently untreated listening space which is highly reflective is adding to the perception? Perhaps the listening chair is currently located in a room null? Perhaps more adjustments are needed to the on axis speaker toe in or the speakers would benefit from some boundary reinforcement? Your loudspeakers may be a desirable piece of modern furniture – but don’t kid yourself – you are listening to the room and are quite possibly a victim of it. And so I directed some more attention to the listening room and also had to chat to Borresen Acoustics about loudspeaker placement. The recommendation that came back was essentially increase the gap between the speakers and place them even closer to the sidewalls and possibly move them closer to the front wall too. I also took the opportunity to run the loudspeaker and listening chair placement through Harman International Industries (USA) mode calculation tool. This tool, essentially a spreadsheet in which you plug in your room dimensions was crafted by Floyd Toole, a subject matter expert in the field of room acoustics. I’ve used the tool with great success in two earlier audio rooms. Lean or thin sounding audio systems are frequently the result of bass roll off or quite severe attenuation below about 500Hz. In my experience stringed instruments, in particular the cello, viola and violin will lose their body and in the case of the cello lose a sense of bloom as in richness and warmth if there are deficiencies in this spectral range. 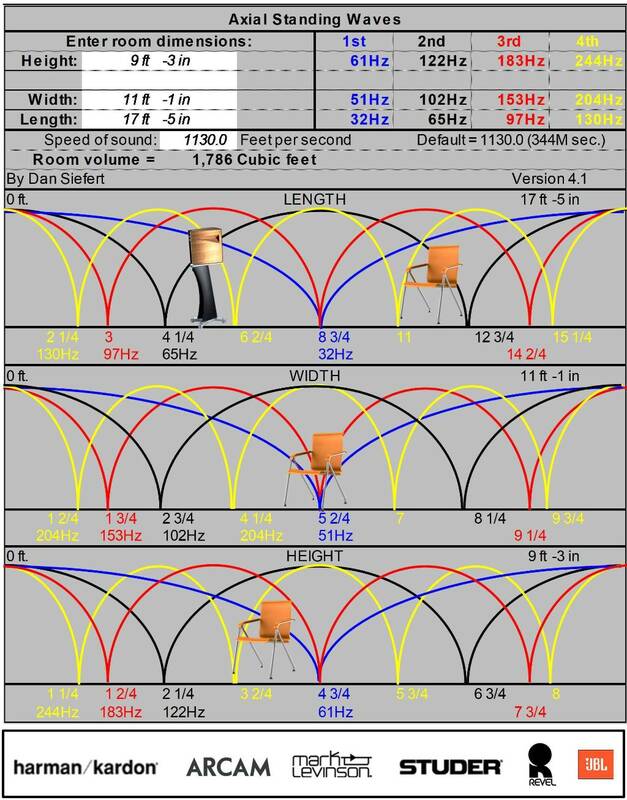 Well to cut a long story short the tool showed my initial listening chair position to be an unfortunate choice, corresponding to a length null of 130Hz and a width null of 153Hz. This was corrected in part by moving the listening chair ½ a foot closer to the rear wall. Further, on the recommendation of the manufacturer I moved the loudspeaker closer to sidewall so they are now just 1ft from the wall with the physical cabinet just 5 inches from the wall at the closest point. Moreover, in concert with the above a more optimal bass balance and better tonal balance was achieved by moving the speakers back by 1ft to the front wall, so they are now 5ft from the front wall. As an added bonus these changes saw improvements to the density of the central image and the dimensionality of the soundstage. Figure 1: Harman International room mode calculation tool. Harman is the largest professional audio company in the world and was purchased by Samsung Electronics in 2017 for a reported US$8 billion dollars; a little over 1x annual revenues at that time. This tool is a great starting point to assess room nulls. Deciding where you will sit in your listening room ranks as one of the most important. I needed to move from a null to an area of more bass extension but without overhang. These simple placement changes largely remedied my earlier criticisms of the overall sound. More tweaking is needed – in particular spatial adjustments via toe in changes, but a least we are heading in the right direction. I know I am still quite a distance from the potential of the speakers and the overall sound and to that end further updates will follow. I think you have too many pieces to know where any one piece is regarding break in. The speakers will take some time. How much I can't answer. When my local dealer got the Borresen speakers I helped unbox them and set them up. I wasn't all that impressed either. We set up all 3 pairs on different systems to get the break in started. Honestly I had a hard time telling the difference between all 3 models. I'll go as far to say Raidho's sounded better out of the box. I returned to the store at various times during the break in and started to notice the difference between all 3 models. Problem was they couldn't track the hours due to several power failures during the first 2 weeks. As of now all the speakers are broken in and it's easy to hear the differences. IMO comparing the 01 to the D1.1 I would say the lows go deeper and are faster. The mids have more clarity and the highs are more 'airy'. To me the 01 sounds closer to the D2.1. Same hold true comparing the 02 to the D2.1. That said the 02 doesn't come as close to the D3.1's in the mids but are better than the D2.1's. The 03 on the other hand have so many more layers of resolution compared to the D3.1's especially in the mids. That said yesterday I placed an order for the 03's and requested the new Titanium Darkz. 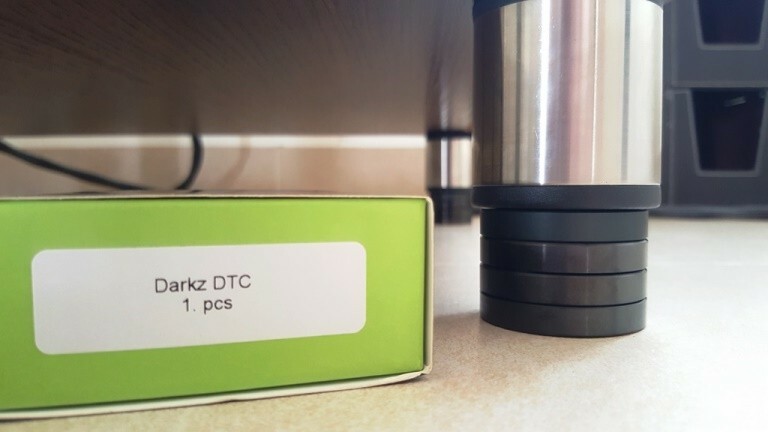 If the Darkz are not ready by the time the speakers are ready to ship they will send with the D-TC Darkz. Lars said he or Mike will bring them Axpona for me. Thanks so much for the feedback George and congratulations on the purchase of the Borresen Acoustics 03 loudspeakers. Wow! Just Wow! You are very fortunate to have such a great audio dealer which has made possible the opportunity to loan product and hear various loudspeakers side by side. 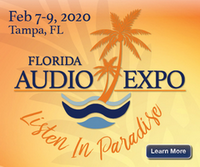 Professional audio dealers are worth their weight in gold – or perhaps in your case, given the footer upgrade - titanium. Regarding the Borresen 01’s I would agree that with lots of stuff breaking in that it’s too early to draw any conclusions. Accordingly I have stressed these are my initial listening impressions and I’ve been upfront in stating the limitations of my early listening impressions including new product burn in and listening room. 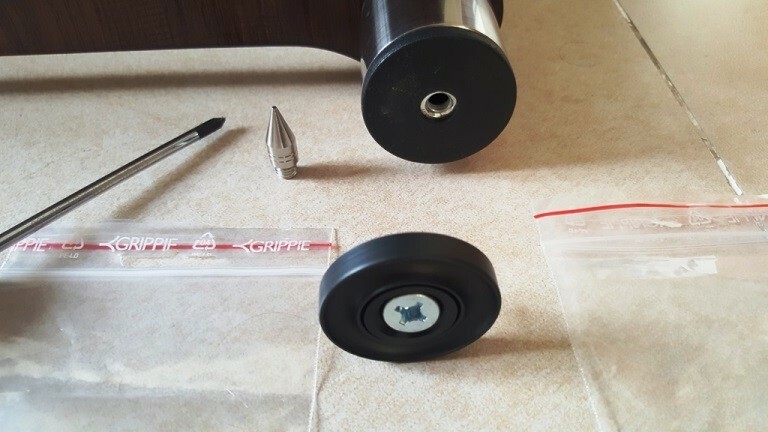 I thought it would be of value to new and potential owners of Borresen Acoustics products to read of my experience and in time hopefully share their own. I don’t know about you, but in times past I’ve sat on the fence when it comes to equipment spikes. Spikes appear seemingly everywhere being often found on loudspeakers, equipment racks and occasionally under electronic components to. Standard spikes are NOT isolations devices, quite the opposite actually. Spikes, at best, are considered tuning devices. This was best explained to me by an engineer who gave an example of spikes on athlete’s running shoes. The purpose is to increase the grip between the shoe and the ground and thus transmit forces more efficiently. This example instantly shows that spike might not reduce the amount of actual force transmission, but actually help ensure effective transmission – the antithesis of isolation. Leading loudspeaker designers arrive at their own and often quite different conclusions. For example Michael Børresen of Børresen Acoustics, Ansuz and Aavik Acoustics is an outspoken critic of spikes. Michael, an accomplished mechanical engineer, maintains that spikes on equipment racks don’t make sense, as the spikes will act like a cartridge picking up vibrations from the floor. Instead Michael maintains you want to ground all the vibrations the rack is picking up from the room and from the equipment standing in it. 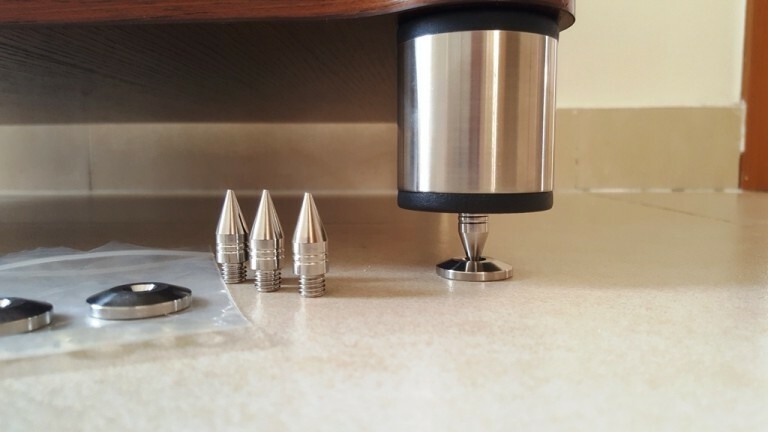 Consequently, spikes are not found on Raidho or Borresen Acoustic speakers either because Michael thinks the only spike in your entire audio system should be the needle of your turntable! These observations underpinned the development of the Ansuz DARKZ product range. At first glance, Alon Wolf of Magico seems to think differently. His speakers are fitted with spikes. 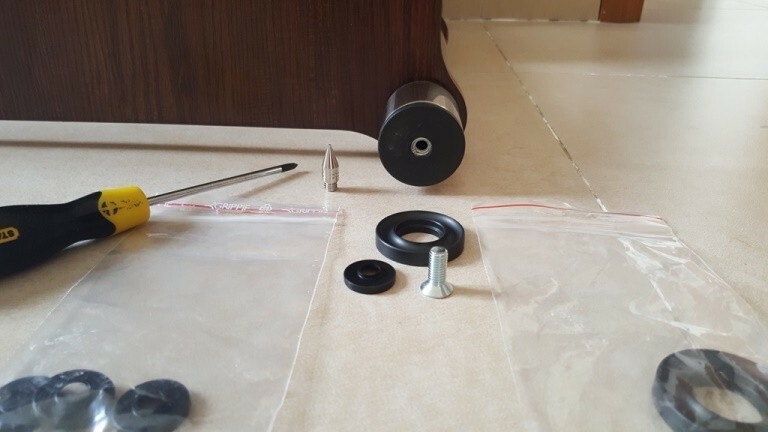 Well initially anyway, because the very first upgrade recommended for upper end loudspeaker owners is to get rid of the spikes and replace them with MPOD’s. MPOD’s with their rounded base still couple the speaker to the floor but not before attempting to isolate it via a layer of damping materials. Effectively floating the component placed each MPOD’s, Magico maintain the results include increased resolution, more focused imaging and improved soundstage. Over the years I’ve owned lots of different equipment racks. By in large these have been reasonably competent, sturdy and lightweight – but nothing to write poems about. From a logistics point of view testing racks and rack footers is a nightmare. With components to switch off, move and switch on again you introduce lots of uncontrolled variables. Further, the time delay between set ups is significant and our audio memories are short! Because of this conclusions are not really possible – only observations. 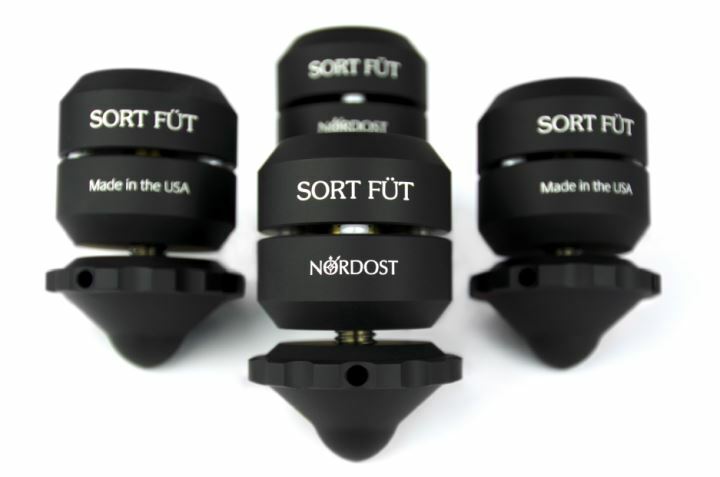 Having replaced footers on earlier racks with the likes of Nordost’s Pulsar Points and Sort Füt footers – observations have been positive but not a night-and-day difference. All of which brings me via a curvaceous route to the research question of this post; will replacing basic spike footers at the base of my equipment rack with Ansuz Darkz footers have a noticeable impact on the sound? Physically speaking, replacing the spike rack footers with Ansuz Darkz footers is a simple screw driver exercise. 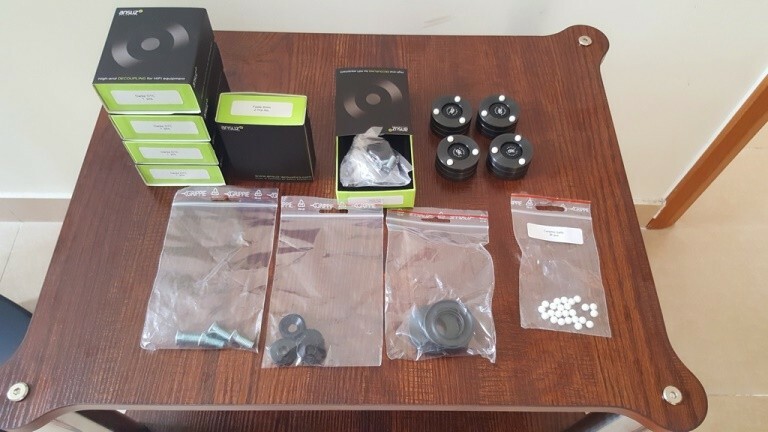 In addition to the Ansuz Darkz footers you also need two boxes of Ansuz “feets” which are coated aluminum discs with screws ordered to match the thread of your existing feet. Ansuz feets provide the channel into which the ceramic balls of the Ansuz Darkz sit. Photo 7: All done – but are the results worth the expense and effort? Given that it’s impossible to do a quick A/B comparison of rack with spikes vs. rack with Ansuz footers I did what I always do. I listened to a few tracks that I know very well taking notes of what I heard. Then after installing the new footers I listened to the same tracks again (at the same volume setting) and noted the differences. It’s far from an ideal listening test but the best I could devise given the numerous limitations. In my next update I’ll provide some details on the listening tracks selected (and why) together with the observations as I heard them. Stay tuned. I had the pleasure on Monday of hearing the Borresen 01 and 02 at Borresen's listening room in Aarhus - I was visiting Copenhagen from the UK during the previous weekend so a short flight to Aarhus was very convenient. Frits, who was my host, is a real gentleman and a perfect example of how to represent a hifi company. Just outstanding. Whilst the 01 was good, for the music I like it could get just a little compressed at high volumes. The 02 was absolutely fabulous. Transparency and space recreation like an electrostatic but with power and slam which one doesn't get with an electrostatic of sensible size. And yet the unit is pretty small, certainly in terms of its frontal facing area. Of course, the 02 was accompanied by the full gamut of Aavik and Ansuz kit, I guess totalling £120k in value; and the listening position is very unusual, being at the top of a really truncated triangle. In this position the speakers are almost like oversized headphones by comparison with the traditional audio set up. This did create a hugely impressive listening experience where, on organ music, one felt one was inside the cathedral of the recording. Listening at home, if this is the next step, will be interesting, firstly because the accompanying kit will have none of the Aarhus components and secondly because the listening triangle, for domestic reasons, will be more conventional, at the top os a sightly stretched equilateral triangle. But so far, a delightful sound from an equally delightful company. Recommended. Listening at home, if this is the next step, will be interesting, firstly because the accompanying kit will have none of the Aarhus components and secondly because the listening triangle, for domestic reasons, will be more conventional, at the top of a sightly stretched equilateral triangle. Great to hear from you IanG and thanks very much for sharing that. What music did you listen too? You may have seen from this thread I’ve owned two pairs of large electrostatic speakers and loved them for their resolution. Domes in box speakers just can’t compete. But I agree, the panel size you need to obtain great bass from an electrostatic is huge and therefore problematic for most listening spaces. It was the ribbon tweeter that first attracted me to Raidho. Finally, a loudspeaker that could resolve fine detail [much better than domes, but still not as good as an electrostatic] and offer a bass woofer which could keep up! This experience has now extended to Borresen Acoustics. Are you considering a Borresen 02 for home? Wow! What would be the partnering electronics components? My seating arrangement for the 01’s is nearfield. This way I hear more from the speakers and a little less from the room. Position wise the speakers are spread as far apart are the room will allow and seating is not an equilateral triangle but an isosceles triangle where the distance between the loudspeakers exceeds the distance from the loudspeaker to the ears. This at first glance seems similar to your audition in Aarhus. Position wise you just need to figure out what works for you and importantly your room.